Below is the West Hollywood Preservation Alliance (WHPA) statement regarding Item 8.A. 9091 Santa Monica Blvd., and Item 8.B. 645 N. Robertson Blvd. that are on the agenda for the Historic Preservation Commission (HPC) meeting of Monday, January 22, 2018. The meeting begins at 7:00pm in the Plummer Park Community Center, Rooms 5 and 6, 7377 Santa Monica Blvd, West Hollywood. 1. The West Hollywood Preservation Alliance (WHPA), a nonprofit community organization dedicated to historic preservation, urges the Historic Preservation Commission to designate the building located at 9091 Santa Monica Boulevard as a local cultural historic resource. A bit of history: the first iterations of the city’s commercial survey in 2016 did NOT include this building as being potentially historic, but through community engagement, the West Hollywood Preservation Alliance campaigned for its final inclusion as did then Mayor Lauren Meister. We are now pleased to see that a formal application for designation has been brought by the owners of the building. Dating from 1924, the two-story, brick building is strongly associated with the period in West Hollywood’s history that accompanied the Pacific Electric Railway’s expansion in the 1920s. According to West Hollywood native and former WHPA Board Member Lyndia Lowy, this building once housed a Maxwell’s Clothing Store and many other businesses through the years, and it is one of the few made of bricks stlll left on the city’s west side. For nearly 90 years, this streetcar-related building has served as highly visible anchor at the western gateway into the city. The WHPA believes that it sustains sufficient integrity to be designated as a cultural resource, and plans for its adaptive reuse appear to be well-thought out. The development of the large Melrose Triangle project across the boulevard will unfortunately result in the demolition of the historic 1938 Streamline Moderne building that once housed the Jones Dog and Cat Hospital at 9080 Santa Monica Boulevard. The cultural memory of our city deserves respect, and the designation as a cultural resource and the rehabilitation of the building at 9091 Santa Monica Boulevard would show that respect. Imagine as you enter our city from the west: the new Melrose Triangle on the south side of the western gateway, and the historic streetcar building anchoring the north side. By the way, that north side also includes some other potential sites for historic designation – the buildings housing The Troubadour nightclub and Dan Tana’s Restaurant. But those can come at another time. Let’s now have your recommendation for designating 9091 Santa Monica Boulevard to forward on to the City Council. 2. The West Hollywood Preservation Alliance concurs with city staff requesting the Historic Preservation Commission recommend City Council certify the Final Environmental Impact Report and approve the Certificate of Appropriateness associated Alternative 3 of the Robertson Lane Hotel Project. Faring, architects and preservationists have worked in concert to preserve and restore and adaptively reuse the Truscon steel modular building known as The Factory as a centerpiece of the Robertson Lane hotel and retail project. 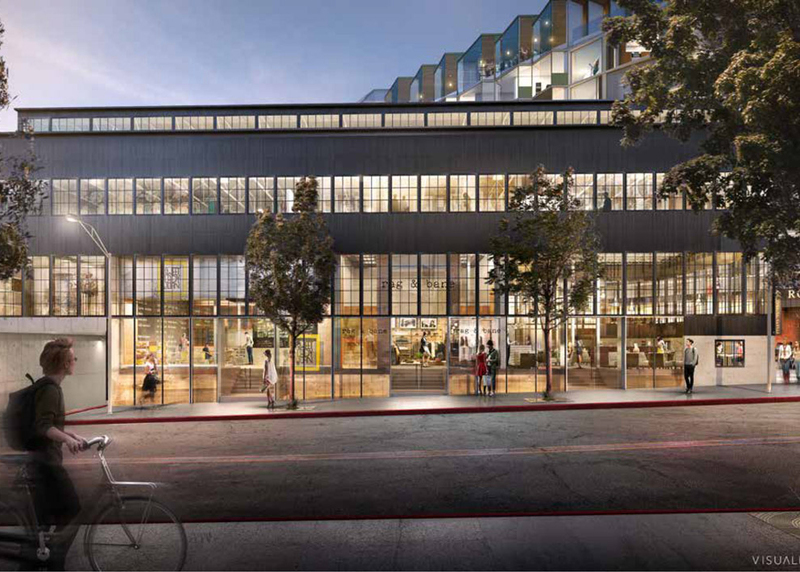 This final version of the EIR now offers an even better aspect of proposed siting of The Factory with a clearer separation of the new architecture adjacent to this landmark building, so important to the history of West Hollywood industry as well as a symbol of the burgeoning recognition of gay culture. Faring proposes to honor the history of the building by addressing controversial aspects of gay life in its documentation of all historic elements, including discrimination against men of color by the gay community via discriminatory entry policies, especially in the 70’s and 80’s. Events in history are not always admirable, but deserve recognition. The preservation community would of course like to see the asset remain its current size, restored in situ by some magnanimous benefactor, but that option is unlikely to ever lead to a full restoration, and some elements of the steel and truss building have significant decay. This iteration is the best chance to preserve this significant, iconic structure. WHPA thanks Faring for its cooperation and forward thinking on the Robertson Lane tract.